The Spruce Creek Culvert is a skewed concrete arch bridge constructed in 1932. It carries State Highway 61 over Spruce Creek about 10 miles southwest of Grand Marais in Cook County. The bridge features characteristic Rustic-style design details that were added by the Civilian Conservation Corps in 1935, including random-coursed, fieldstone veneer, stone piers, and log railings. The Spruce Creek Culvert is significant for its association with the CCC and as one of the few remaining roadside development facilities on State Highway 61 that date to the state’s early construction and improvement of the scenic highway. 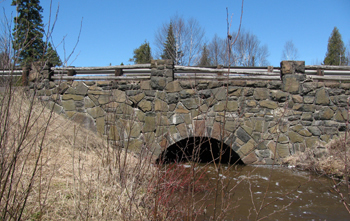 The bridge is also significant as an excellent example of the application of the Rustic style to a small highway bridge.